The Spurs defeated the Pistons tonight in downtown Detroit by a final score of 119-107 for their fifth consecutive victory. DeMar DeRozan led the Spurs with 26 points (12-21 FG), 7 rebounds, 9 assists, 2 steals and 2 blocks, while LaMarcus Aldridge finished with 25 points (9-12 FG), 6 rebounds, 2 assists and 1 blocked shot. 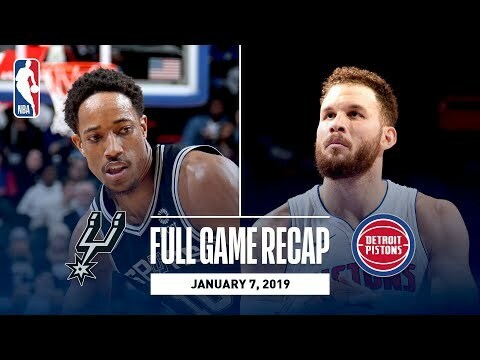 Blake Griffin led all scorers with 34 points (13-21 FG), to go along with 2 rebounds and 8 assists for the Pistons, while Andre Drummond recorded 19 points (9-14 FG), 14 rebounds and 4 steals in the losing effort. Gregg Popovich has now tied Jerry Sloan (1,221 victories) for the third-most victories by a head coach in NBA history. With the win, the Spurs improve to 24-17, while the Pistons fall to 17-21 on the season.